Garage Builders|Garages Built on Site | Handyman Augusta Ga.
All of our garages are built per the customer request. All garages are built by the guideline set by the building codes of Ga. or S.C.
All garage are inspected and signed off on for occupancy. Building material is set by the customers needs for the garages use. We can build them free style or attached, completely up to the customer. Siding and roof material is also determined by the customer. Please call us if your looking for garage and need an estimate,there free. 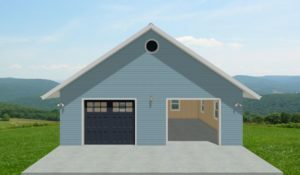 Tells us what your looking for and we will design it and show it to you in a 2D drawing complete with driveway or pad. You'll know exactly how it will look before you buy it. Most driveways want hold concrete trucks. 24'x 24' Gable Customer on budget. This is all we did. 24' x 32"Cabin Shell in woods. We also poured the concrete pad. 3/4 done needs doors and electricity. Garage finished and we poured concrete pad. 32'x 24' Gable roof, this was on a farm. We did all the grading on job.